What a fascinating trade paperback! I am always a little leery of series produced by two publishers. Too often, they can lead to a muddied product that doesn’t stand out as belonging in either company’s catalog, but The Torch, this joint venture of Dynamite and Marvel, is really quite well done. I’m not sure when Alex Ross became the go-to guy for all Golden Age characters, but since he has that role, it makes sense that he’s responsible for plotting and character design in this trade. Mike Carey's character-based scripting really brings this story to life. Contrary to what you’d expect, the lead characters for this trade paperback are actually Toro and the Mad Thinker. While the Torch appears in every issue and has an important role to play, he’s basically a robot for most of the book, leaving the thinking and feeling to the more mortal characters. 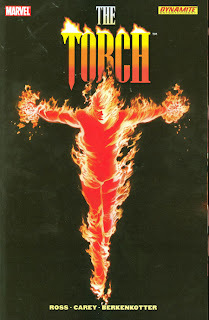 The Torch is one of those characters that doesn't have a strong personality to define him, and Alex Ross and Mike Carey embrace that fault in this story. The Torch only gets to be the hero he is because of his friendship with Toro. Toro is recently returned to life after the recent Avengers/Invaders TPB, but really, the how and why doesn’t matter. What does matter is that Toro is struggling to find his place in the world. As this takes place during the Dark Reign event, he doesn’t think he belongs on the Dark Avengers and Bucky seems to have lost his number. So he spends his time drinking and remembering what life used to be like. Toro is a sympathetic character; I didn’t know much about him before this trade, but he does well in the spotlight. I’ve always liked the idea behind the Mad Thinter but at times, this series seems to focus on him too much. We see the Mad Thinker obtain financing, set up his headquarters and eventually start on his experiments. The Thinker is a cold and cruel master; he relishes the opportunity to demean his lab assistants and employers whenever he can. Alex Ross’ character design in the back matter is excellent, and it includes an image of a nice Kirby-esque teleporting watch. The Mad Thinker is excited at the opportunity to use AIM’s funding to create a new smart weapon to target at an Eastern European country. When the Torch falls into his hands, he relishes the chance to use his old foe as the smart weapon. The Thinker is jealous of the Torch’s creator, Dr. Phineas Horton, as someone who has created something lasting. The Thinker knows that until he creates something that everyone will remember, he is just a footnote in history. Instead of creating, the Thinker modifies the Horton Cells that make up the Torch’s blood into a new mind-control device. It lets him control the Torch, but even better, it lets him control anyone infected with the red cells themselves. This leads to an exciting infection story setting up a rematch between fire and water. Of course, Namor is infected and taken over, leading to a throw-down between Namor and three flaming heroes, the Torch, Toro, and the Human Torch of Fantastic Four fame. This is a memorable sequence, only partly because of the challenge of identifying which fire-guy is which. All the while, the Mad Thinker is still pulling the strings. Eventually, Ross and Carey bring things back to the Torch’s World War II roots with some good Nazi villains and a new “Inhuman” Torch. (Naturally, the Mad Thinker is heavily involved again.) This closing portion of the book not only sets up a possible arch-rival for the Torch and Toro, but a new locale for the Marvel Universe to play in. I haven’t seen a city like the sunken, forgotten New Berlin used as an ongoing location; I’d love to see more of it. Patrick Berkenkotter’s art is reminiscent of Dougie Braithwaite, but he sticks to the Alex Ross designs nicely. Toro’s new suit doesn’t scream “fire guy” at me, but it is a distinctive suit. Maybe it’s the lack of logo that confuses me. Overall, The Torch plays to the strength of both writers. Alex Ross is great at rejuvenating Golden Age characters and leaving them in a place where someone else can use the character in modern times. Mike Carey is brilliant at dealing with identity and loss in his work. Both creators get to show off what they do best in this collection. Thanks Timbotron. New reviews next week! I'm not familiar with this but am curious. Why was it a joint publication of Marvel and Dynamite? I think Dynamite is Alex Ross' studio or company. I believe that the 3 miniseries he did for Marvel involving the Invaders (Avengers/Invaders, Torch, and Invaders Now!) all had the Dynamite logo on them. I picked up the Torch trade as an impulse buy in my LCS one day, and boy am I glad I did! I thought it was a great story that really made me care about a couple of Golden Age Marvel characters that I didn't know a whole lot about before it. It was the reason that I picked up the Invaders Now! hardcover when it came out. Alex Ross has been a creator at Dynamite, but it is not "his" studio or company. Maybe he has some exclusive deal with them and they worked out something with Marvel for those 3 miniseries? That's my impression, Mark. I think Ross likes working with Dynamite and they just sort of partner up with Marvel for these limited series. As I said, I was impressed with this one, I thought it was stronger than the Avengers/Invaders series.